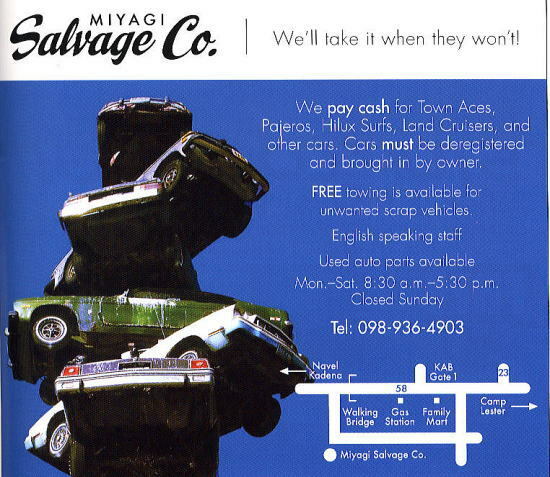 Miyagi Salvage ( Miyagi junkyard) is the best Authorised Vehicle Junkyard in Okinawa. Okinawan #1 junkyard. Miyagi buy your junk cars in the Okinawa Island. The gate is closed from 12pm to 1pm for the lunch. Miyagi is closed Sunday and Japanese holidays. Junk yard is not like a super market. Sometimes danger. Please take care by your self. Miyagi got a new Tire shredder for Okinwan tire recycling. We will pay cash for your junk vehicles. Pleases take your junk vehicles (junk cars) to our junkyard. Free pickup is available in Okinawa Island. Miyagi Salvage Co. is authorised from japanese recycling system that is made from all vehicle brand name in japan and all import bland. We want to keep clean okinawan environment. 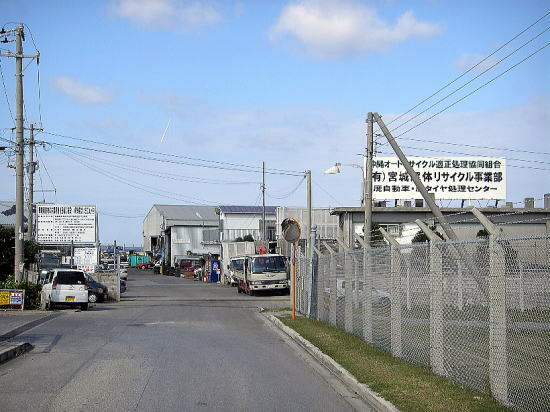 We keep a lot of vehicles (junk cars) for the used parts and tires for Okinawan vehicles. Please come and check many parts for your treasure.